At the Galaxy Unpacked event today, Samsung has finally lifted the covers off the Galaxy Watch. 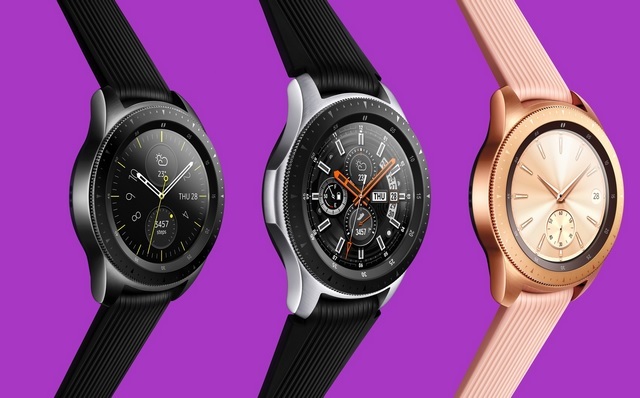 Samsung has ditched the Gear branding and has introduced a host of new features such as stress and sleep monitoring, new watch faces and customizable watch bands among others. The Galaxy Watch has been launched in two variants, a 46mm version which comes in silver color, and a 42mm variant that will be available in rose gold and black. Buyers can customize the straps, which will be available from Braloba. 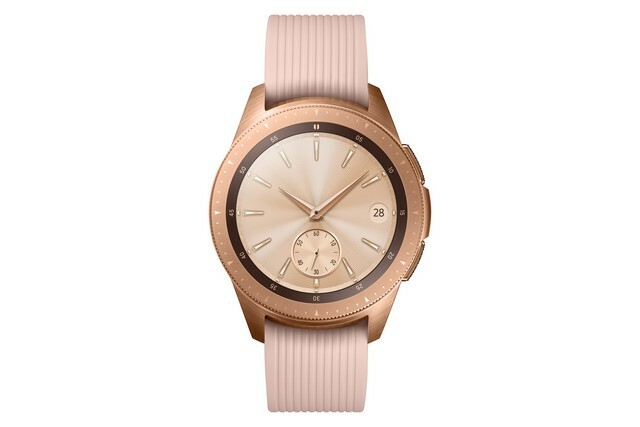 The Galaxy Watch features a circular design with rotating bezels for navigation and selection, The watch also has analog watch hands and hourly chimes to give it the look of a conventional wristwatch. The Galaxy Watch’s 46mm version features a 1.3-inch Circular Super AMOLED display with a resolution of 360 x 360 pixels, while the 42mm version features a slightly smaller 1.2-inch display with the same resolution, and is covered by a layer of Corning Gorilla DX+ for protection. The Galaxy Watch is powered by a dual-core Exynos 9110 processor, coupled with 1.5GB of RAM and 4GB of internal storage on the LTE variant, while the non-cellular version packs 768MB of RAM and the same amount of internal storage. 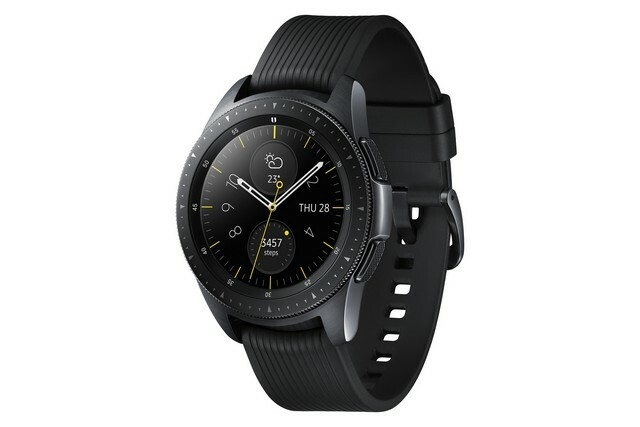 The Galaxy Watch boots Tizen-based Wearable OS 4.0 and is compatible with devices running Android 5.0 or later versions as well as iOS 9.0 or above. The 42mm Galaxy Watch comes equipped with a 270mAh battery, while the larger 46mm variant packs a 472mAh battery. The Galaxy Watch comes with an IP68 rating as well as a MIL-STD 810G certification for ingress protection, and can function perfectly while taking up to 5 ATM pressure. The 46mm variant uses 22mm straps that will be available in Onyx Black, Deep Ocean Blue and Basalt Grey color options, while the 42mm Galaxy Watch has 20mm interchangeable straps that will be available in even more diverse hues. On the software side, the Galaxy Watch comes with support for SmartThings, Samsung Health, Samsung Flow, Samsung Knox, Bixby and Samsung Pay. As for the new features, Samsung has partnered with Spotify for a new feature which allows users to listen to songs while they are offline, and without a smartphone, thanks to the Spotify Offline mode. However, you would need a Spotify Premium subscription to use this. The Galaxy Watch also features a new stress management tracking functionality, which automatically detects stress levels and suggests breathing exercises to alleviate stress and help users stay focused. Moreover, an upgraded sleep monitoring feature is also on board which tracks parameters such as REM cycles to help users better manage their sleeping habits. Samsung has also added 21 new indoor exercises to the Galaxy Watch which help users manage their fitness regime, alongside an intuitive calorie tracking and personalized alert feature which works in tandem with Bixby Vision for better diet management. The Galaxy Watch will hit the US market on August 24 and other markets on September 14, however, pricing details are not known.